Powering up my Melody 2A3 integrated, I observed one of its stock Sovtek power tubes turn red the other day in an undeniable urge to self-incinerate. Time for a tube replacement. Where to go in Cyprus was the question. I logged onto Melody-Europe's distributor page, scrolled down to Greece and fired off an e-mail to Xaitas from Nexus Acoustics listed there. He turned out to not stock Sovteks but recommended the 40-watt JJ/Tesla 2A3s as the ultimate 2A3 instead. "With the punch of a 211" no less. Faced with such promise, I capitulated but did first check with Melody's US distributor to assure compatibility. He returned terse affirmation from the factory in China a few days later. The 40 was a go. Taking a chance on something new and unknown (I'd never heard of this particular valve before but hadn't really done any research, enjoying the stock Sovteks just fine), I ordered six valves from Xaitas - four to listen, two for backup to not be stuck with a downed amp again the next time a power tube turned red to lie about longevity. JJ Electronics in the Slovak Republic started operations in 1994 with 700 sq meter production facilities. Today JJ owns more than 12000 sq meters of production floor and produces 20-some tube types, amplifiers, preamps and capacitors. Their website tells us that for tube manufacture, they use "assembly precision of no more than ± 0.02 mm. Before they are assembled, all parts are thoroughly cleaned using such methods as an ultrasonic bath, chemical cleaning or annealing in an inert gas atmosphere of hydrogen or nitrogen. A thorough inspection is performed on every component of the tube's internal system before assembly. Assembled systems are then sent to sealing in a glass envelope. During the sealing procedure, the temperature of the glass pass-through joints must be controlled and joints are gradually tempered to relieve the inherent thermal stress. "Next, the assembled glass envelopes are evacuated by mechanical and diffusion vacuum pumps. During this process, the cathode emission coating is activated. All internal parts are heated by a high frequency heater and any spurious dust particles are evacuated. Finally, the getter rings are activated while they absorb any residual gas inside the glass envelope of the tube. Every tube is then electrically tested for all parameters which are the key to a flawless operation and great sound. Specifically, these parameters include leakage characteristics, internal vacuum level, cathode emission capability, filament voltage and current, anode current saturation level, microphony and others. Every month, random samples are taken from the production line in order to perform a life time test of 5000 hours under nominal conditions or 1000 hours at maximum specified ratings." present day single-plate 2A3s are merely 300Bs with their filaments folded in half - 5V/1.2A for a 300B, 2.5V/2.5A for a 2A3. The 300B has basically twice the voltage and half the current of a 2A3." 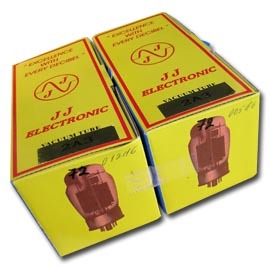 Or as JJ puts it, "The JJ Electronic triode 2A3-40, introduced at the 2003 Las Vegas CES show, has, in contrast to the 300B triode, a heater voltage of only 2.5V. This, when combined with a heater center tap, results in a smaller potential difference with respect to the bias voltage and larger active cathode surface. The result is better sound quality." 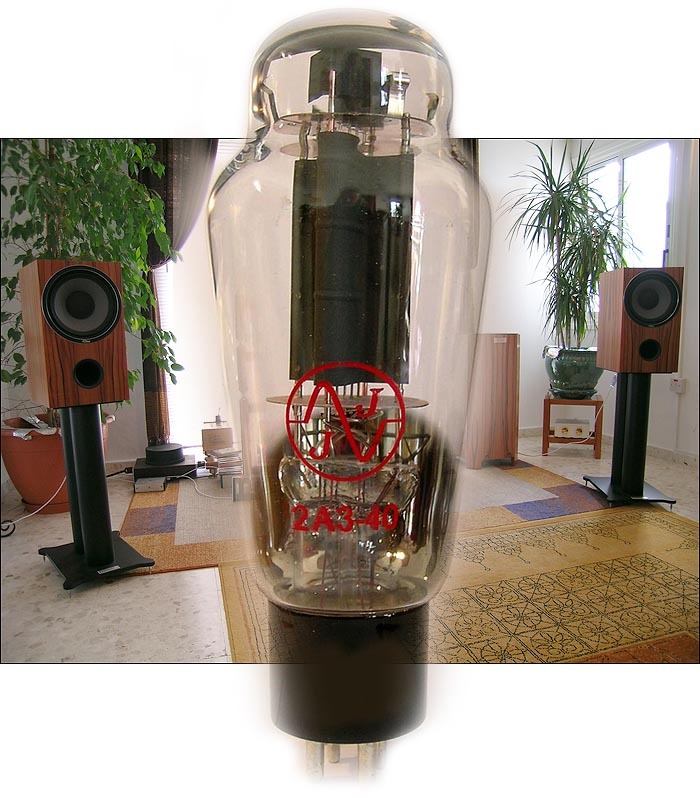 According to JAC Music in Germany, the JJ/Tesla moniker is a misnomer in the same way that Yugoslavian EI tubes today are made on old Philips machines without being referenced as EI-Philips. Apparently Tesla discontinued manufacture of EL34s and KT88s in favor of transmitter tubes, vacuum capacitors, klystrons and military devices - see their present site for details. Tesla machinery from the Rosnow plant to produce those audio valves was then moved to the JJ factory and certain JJ tubes continue to be made on original Tesla equipment today but by different people. The Tube Store calls JJ "the newly reorganized Tesla factory, recently relocated in the Slovak Republic. This legendary tube factory has built many OEM tubes under brand names such as Telefunken, Siemens, Amperex, Mullard, and Brimar." The Tube Depot's version of the history is identical. "Formerly known as Tesla, JJ tubes are made on some of the original European equipment that was used in the heyday." Euro Tubes has a factory tour of JJ. where it remains today. It became known as Tesla by 1948 and in the 70s had specialized in big radio transmitter tubes where ceramics replaced prior glass parts and power outputs peaked with 250kW triodes. In 1980 Tesla merged with the Research Institute for Vacuum Technology for 10 years before becoming independent. "Since then, Tesla has been a manufacturer/distributor of transmitting tubes and high-power klystrons for use in broadcasting and television transmitters with high frequency output power ranging from watts to megawatts; power grid tubes for use in R.F. heating and industrial applications; and vacuum interrupters for use in vacuum contractors for motor control." JJ's own 239 single-ended amp outfitted with a 2A3-40 makes 10 watts with an anode current of 80mA. The JJ 322 parallel single-ended dual-mono stereo amp or integrated with 300Bs can be had as the 323 with 2A3-40s for 22wpc. This overview explains it well. The new tubes in my possession are JJs made in the Slovak Republic, not Teslas as they're sometimes referred to as though they were from the Czech Republic neighbor in the northwest. The only connection between these two companies is historic and certain transferred machinery. Now that we know what's what, how did these 2A3s compare to the Sovteks besides being more expensive (though less than the Emission Labs which fetch between €357 and €404/pr in Europe). The Full Music bottles go for €200/pr here and the Electro-Harmonix Sovteks range from €78 to €157. In this company, the JJs are second from the top but money doesn't always tell the whole story. For a real rather than memory-based A/B, I would use a friend's pair of Fi 2A3s since I only had three functioning Sovteks left. I could only hear the Melody with the JJs. As classic single-ended amps, Don Garber's monos take one power triode per channel to allow 'hot swapping' from my remaining Sovtek arsenal. As reported in the Melody amp review, its performance in my rig and a friend's 110dB+ horn system suggested that the Chinese integrated was cunningly voiced around the cheap Sovteks. 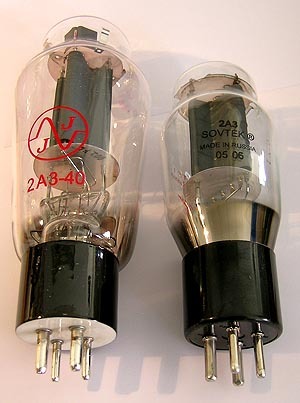 What led me to that conclusion was the same pair of Fi monos which I'd been loaned sans output valves. 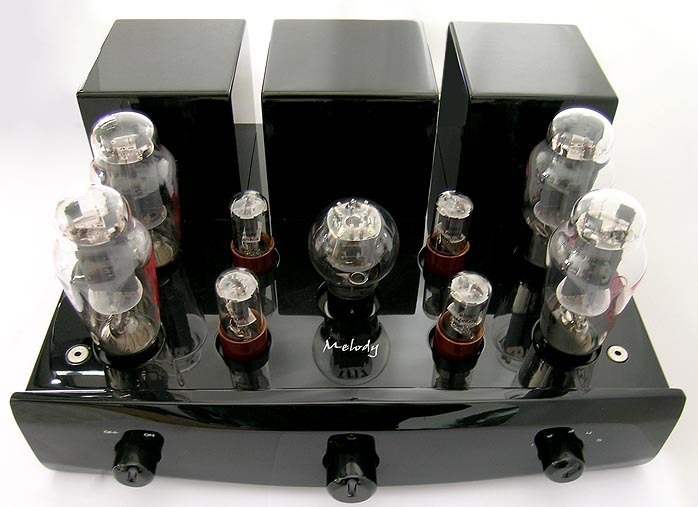 Outfitted with Sovteks, these designer amps didn't sound as sophisticated and refined as the Melody, betraying a certain coarseness and steeliness one usually associates with inferior tubes. Needless to say, Sovteks are not what Fi owners would usually stick to their amps. I finally had a chance to hear these amps with more upscale output devices now and, by comparison, learn just how much separates the Slovakian from the Russian glass. Or not. Besides more expensive, the JJs are also bigger, heavier and all-around more substantial. Before even powering up, there's evidence already what the extra money bought you in build quality. Once you power up, your ears will be at hello as well. Pulling out the Sovteks was a bit like replacing 50-watt with 100-watt light bulbs. You see more. The JJs sure acted as though they played louder, with more bass, more dynamics and more of that pace'n'rhythm drive. Of course playing louder will do all that and more. On Curandero II [Aras, Silverwave 911], the original flamenco guitar and tabla duo of Miguel Espinoza and Ty Burhoe doubles in size to include Bela Fleck on banjo and Kai Echkardt on e-bass for some high-octane playing of complicated acoustic music. The JJs simply had more pop on tabla attacks, more incision on frame drum tremolos, more life on banjo harmonics, more crunch and growl on bass quivers, more bite on guitar arpeggios. Despite higher energy, liveliness and contrast ratio, there was nothing inherently glassy or forward about the proceedings unless enforced on subsequent and lesser recordings. The Sovteks might have been a bit more extended on top, the JJs were clearly fatter in the middle but it was no contest. The Sovteks sounded comparatively washed out - homogenized and sterilized once I came off the greater life factor and swagger of the Slovakians. The difference reminded me a bit of the first time I replaced standard 300Bs with KR WE clones. While some people accuse the latter of being mechanical, more wiry and stressed rather than relaxed as the WEs and so lacking in the sophistication of 'the real thing', at the time I wasn't comparing them to the Western Electrics. I was comparing them to TJs and Gold Aero-branded bottles whose true origins prior to rebadging as Gold Aero I never learned. This time, I had no EMLs or TJs to include possible genre leaders but then, this wasn't a formal assignment. 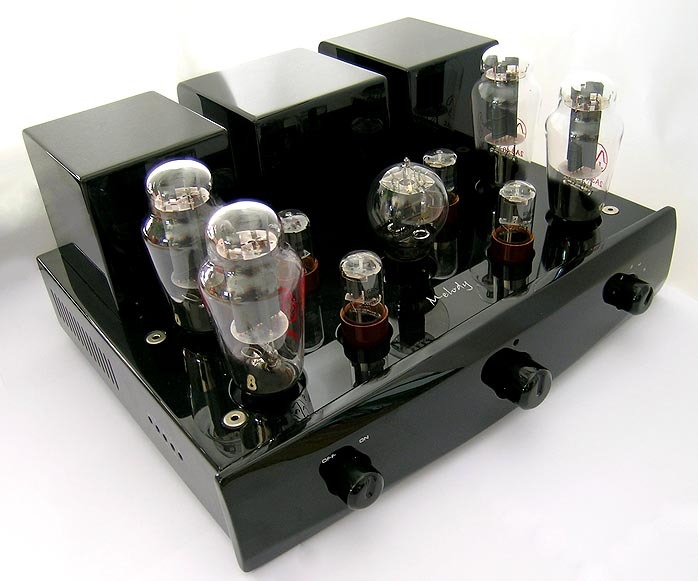 I was retubing personal amps with different valves and sharing a few notes while at it. When I acquired the Melody amp, I had peeled out two of its Sovteks, stuck 'em into the Fis and clearly preferred the Melody. The JJs turned tables now and had Don Garber's monos pull ahead of the Melody amp when both were fitted with the Slovakians. The Fi/JJ sound was closer to my Yamamoto/EML45 flavor than any 300B amps I've had through. 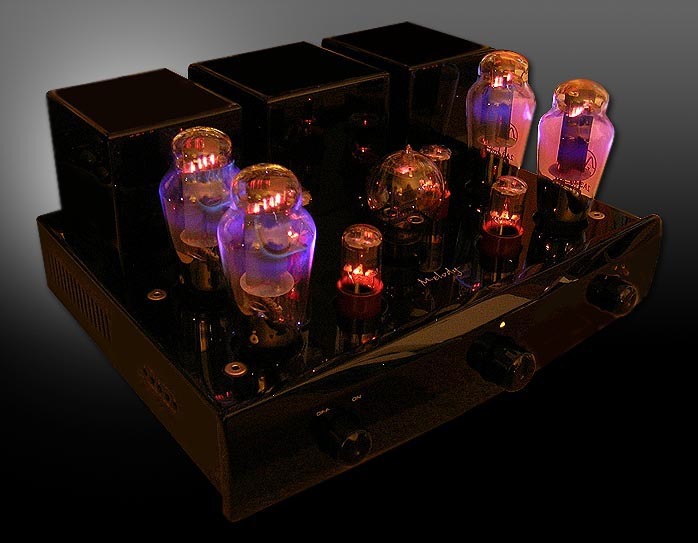 This is no ultimate statement -- tubes will sound different in different circuits -- but a general pointer. I'd still give the 45s the nod in the treble and for overall elegance but the 2A3-40s take the lead in body, image density and midrange presence. And these particular variants are jumpy and dynamic adrenaline buggers, not at all the buttoned-down pipe'n'slippers fellas the uninitiated mistake low-power direct-heated triodes for. Slaps on the high tabla cracked hard, Bela's banjo really leaned into twang city on accents. This was probably the 211 punch Xaitas had mentioned. I'm no 211 expert by any stretch, knowing only that their 845 derivatives, to my ears, have always been a bit fat and fuzzy and loose. None of that was even remotely in evidence with the JJs. They were controlled and tight and alive with testosterone. If anything, my WLM Diva Monitors lean a bit to the fatty side so tubes I like to drive them with mate better if they err on the side of vigor and incision rather than relaxation and comfort. Of course inherently bright pop productions like La Cubanita by Los Niños de Sara [Atoll 91134-A], a Gypsy Kings inspired outfit often fronted by Ishtar of Alabina, left nothing to the imagination - close-miked sibilance, pounding drum machines, synth trumpets all were plainly presented as the cheap tricks they are, more so on the leaner, more open single-ended amps than the push/pull Melody which is a bit warmer and fuller if not as immediate. But that's just being honest if you're a tube. The music lost nothing except audiophile pretensions it never had. I enjoy Gypsy Rumba, the male lead singer here is real good and the JJs brought it all home with verve and cheap thrills. A superior Gypsy music recording of different stripes -- Russian, with the super-virtuoso Talisman trio on ARC Music -- suffered zero sonic blemishes. Instead, they had the JJs dig a lot deeper than the Sovteks into the complex intertwining layers of instruments, voices and acoustic FX origins where the instruments are used in unconventional ways to make sounds they usually don't . PS - Soliciting some reliability feedback on JJs, reader Robert Rosenow shared the following: "The 2A3 looks to be a JJ 300B with a 2.5V filament - same chimney anode structure etc. I have had JJ 300Bs in use for some years in a variety of amps - all SET. I tried the JJs for the first time with some trepidation. I had NOS and OS Cetron, Sino and Svetlana 300Bs on hand. Variously some exhibited hot spots with avarage current through the tube. Some took a long time to reach bias stability. The JJs were winners from the start - rock-steady bias, no hot spot plate anomalies, excellent sonics, good base and so on. To date the JJ tubes have been rock-solid performers. My guess is that the 40W 2A3 would be the equal of a JJ 300B in every way except filament voltage."